I haven’t made mug mats in a while now. I will make some more later, after my constant travels. In November to Nebraska, December to Arkansas, Colorado, and California, and this month we plan to go to South Dakota, Arkansas, and then to Belize. I’ll be happy to be home at least for a little while after this :). One Mug Mat I made around Thanksgiving, was a vintage looking mug mat, or I like to call it a tea-time mat. It’s slightly bigger; just the right size for a small platter and the tea cup. 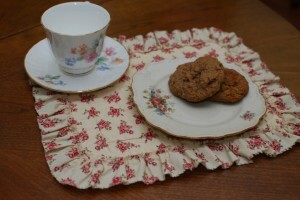 I plan to experiment and make a variety of vintage mug mats, or tea-time mats. I bought a couple of Moda fabrics that have roses on them, which I think look vintage. Anyway, Here’s the picture of the one I made. What do you think? 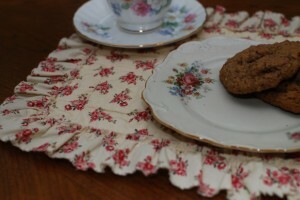 If anyone has any suggestions on how to make the mug mat look vintage, frayed edges, and any other ideas, do let me know. 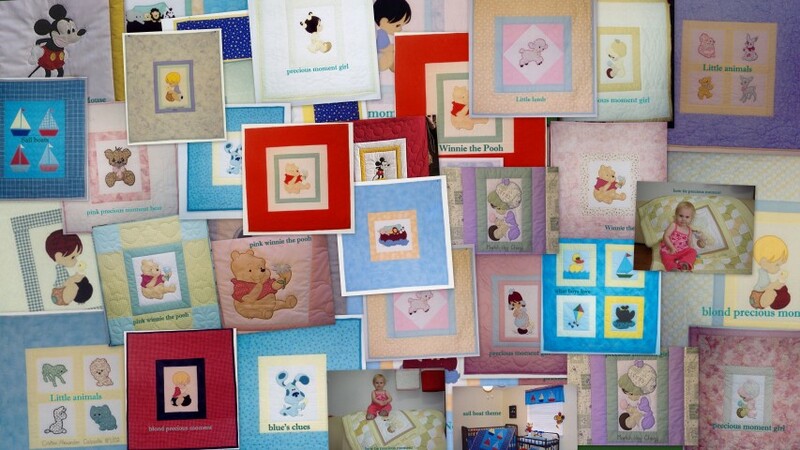 Fun Mug mat photo shoot!